Walk a marathon a fortnight by getting the bus! New research from Macmillan Cancer Support has shown that bus commuters walk a distance equivalent to a marathon (26.2 miles) every fortnight by simply riding and walking their regular route to and from work. 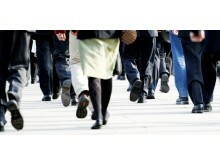 According to the charity, one in nine workers spend more than 40 minutes a day walking as part of their commute - including getting to bus stops and the office, using escalators and while changing services. The survey also showed that one in five UK workers (19%) admit their commute is the most active part of their day, with up to eight hours spent seated at work. And back at home, even more time is clocked up sitting down – up to almost two and a half hours (149 minutes) watching TV and over two hours (127 minutes) while checking personal emails, social media and browsing the internet. Whether you'd like to realise the benefits of walking for exercise, weight loss, or you're training for an actual marathon or sporting event, we have some tips to help you get the most from your ‘Way to Work Workout’. Pick up the pace: Try power walking to your stop – not only will you get your heart rate going but you could even make it in time for the earlier service! Move it: Exaggerate natural movements such as swinging your arms to move more and burn extra calories.